Mildred Lyle Begley, age 93, of Redfox, KY, died Saturday, November 17, 2018 at the Letcher Manor Nursing Home in Whitesburg, KY. She was born at Carbon Glo, Kentucky on December 15, 1924 to Emmitt Blair and Mary Elizabeth Carroll Blair. 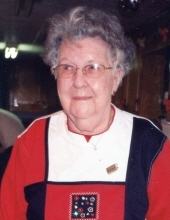 Mildred was a member of the Rose of Sharon Chapter of the Eastern Star, VFW Ladies Auxiliary and American Legion Ladies Auxiliary. Funeral services for Mildred Begley will be held 1 PM Friday, November 23, 2018 at the Hindman Funeral Services Chapel with Rose Of Sharon Chapter of the Eastern Star officiating. Burial will follow in the Lakeside Memorial Gardens in Somerset, Kentucky. Friends may call for visitation 10 AM – 1 PM Friday prior to the funeral.